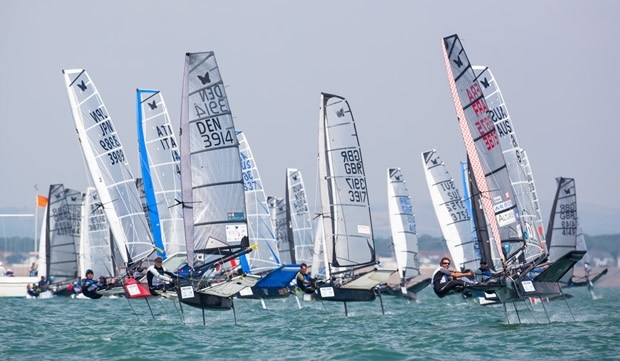 Day two of racing at the Moth World Championship in Hayling Island started around 1pm after the westerly sea breeze filled in. Blue fleet made up for their lost race from Saturday and then sailed two more races in the best of the breeze. Greenhalgh said after the racing: "Confidence is high - that's three wins in a row and I was leading the race, which was abandoned at the end of the day. In the light airs today it was very important to get off the line and after that I was very happy with my speed." David Cambell-James on the leeward mark boat took particular note of Greenhalgh's start in Blue race 3 particularly, "He started on port at the pin end and crossed the fleet comfortably. He was off." Luna Rossa AC helmsman Chris Draper ended his day on a better note with two fifth places after coming acropper in the early Blue fleet race. He explained: "I was pushing it a bit hard downwind and speared it in just before the finish. To make things worse Simon Hiscocks just got past me on the line." Olympic 49er sailor Stevie Morrison has been consistently getting results around 15th and was happy with his day on the water. After finishing 50th at the nationals, he had some setup advice from Nathan Outteridge which has helped his foiling stability immensely. Even so, e said the top guys can pull a new piece of kit out of the bag to gain a bit more pace, or as Nathan jokingly said at the bar having a beer with him: "You just need to spend to win in this fleet!" With only three or four qualifying races completed so far, depending on which fleet each helm is in, qualifying has been extended into Monday with the reserve day on Tuesday now being used for Gold and Silver fleet racing. Sunday's Yellow fleet will head out early to make up for their lost race. The overall results to date are tricky to show with the fleets out of sync. Of the Brits, Robert Greenhalgh is looking good with three bullets and an 8th and Chris Rashley has 1,2,1 in his three races. The Antipodeans are also looking strong with Josh Mcknight scoring 3,1,3, Scott Babbage with 2,2,3,4 and Nathan Outteridge scoring 3,2,2 after his gear failure before race 1 of the series gave him a DNC.